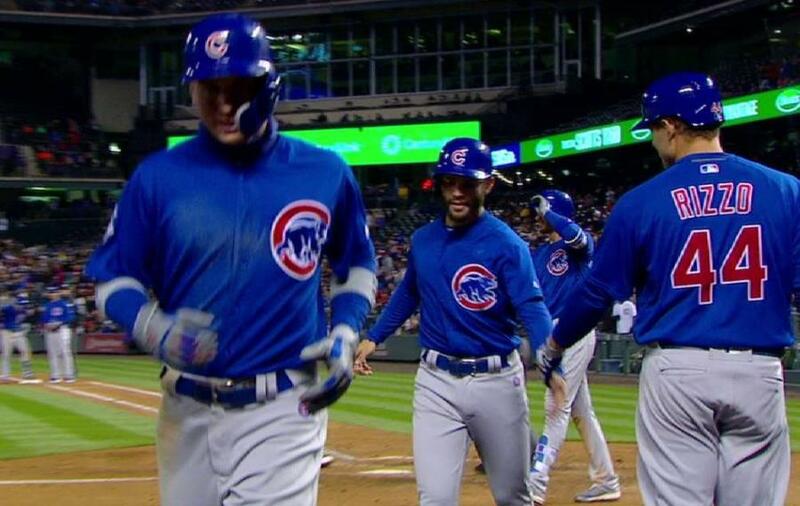 On Friday night, the Chicago Cubs throttled the Colorado Rockies 16-5 at Coors Field under conditions fit for a duck. Following five postponements in their schedule in just April due to weather, the Cubs manager Joe Maddon wanted to get the game played on Friday night despite the rain simply because the previous night the team had played so well in defeating St. Louis 8-5. It may just be a two-game segment of the 162-game regular season but Albert Almora Jr. and Javier Baez showed they can be the table-setters Chicago has missed since the end of the 2016 World Series when Dexter Fowler skipped town through free agency. In two games, the Cubs have put 24 runs across the plate with Almora and Baez involved in nearly everything. Baez said following his four hits in Friday’s win that he and Almora have very similar swings. The two may not be what would be called ideal one and two hitters in a batting order, as neither likes taking pitches and both have problems with low and away sliders. However, when the two make contact, it makes things happen and sets the table for the Cubs offense to have a big game. Almora posted a career high in hits on Friday with four and he and Baez have been using the entire field to spray their hits. The two ended the game a combined 8-for-12 with six runs and five RBIs. Baez is playing at an MVP level to start the season. He has been known for his defense and base running abilities and now the offensive contributions he is making mean he could be in the running for the coveted National League MVP award. However, for manager Maddon what is important now is the top of Chicago’s batting order. On Friday, for the first this season after 17 games the same lineup was used by Maddon on successive nights. Almora and Baez will be at the top of the order again Saturday, yet no guarantee follows that, as Maddon likes everyone to play in April to help establish his main lineup and batting order for the remainder of the season. The bats are finally coming around for the Cubs after suffering at the plate and not making good contact this first month. On Friday, the team tied a nine-inning mark for 2018 with eight hits to the opposite field a day after hitting seven. Almora and Baez may not remain one and two in the order for long, but if they continue to produce they will be right back there again when Maddon decides on his final order during May.